INTERNOS was born as a result of an unlikely meeting between the CEOs of fellow Miami IT firms, Ready IT and New Global Solutions. While waiting to board the same flight for a tech conference, both discovered that aside from having competing companies with similar business models, they were both tech geeks who shared a real passion for creative, proactive information technology solutions—in their words—simply “a different kind of IT.” A merger seemed like the next logical step to gain market share and grow their portfolio. So they turned to VSBrooks for marketing direction from the ground up—a new brand and corporate identity package—and InspiraD3 was tapped to design a new website and digital campaign. The website would be designed and created to reflect the company’s new direction and brand. Meanwhile, Ready IT and NGS’s existing clients would need to be advised of the impending merger and reassured that they wouldn’t be “lost in the shuffle.” Employees of both companies, from the start, would also need to feel that they were being included as a part of something newer and better, to avoid any “us vs. them” issues down the line. The Latin name of INTERNOS (meaning “internal”) was chosen to sum up the new brand, with the tagline: Intuitive Technology. Based on the new corporate ID, InspiraD3 designed teaser e-blasts to be sent to existing customers of both firms, building anticipation to stay tuned for a new and improved company website. The website required a CMS architecture that allowed Internos to actively update their blog, establish them as leaders in the industry, and be SEO optimized. 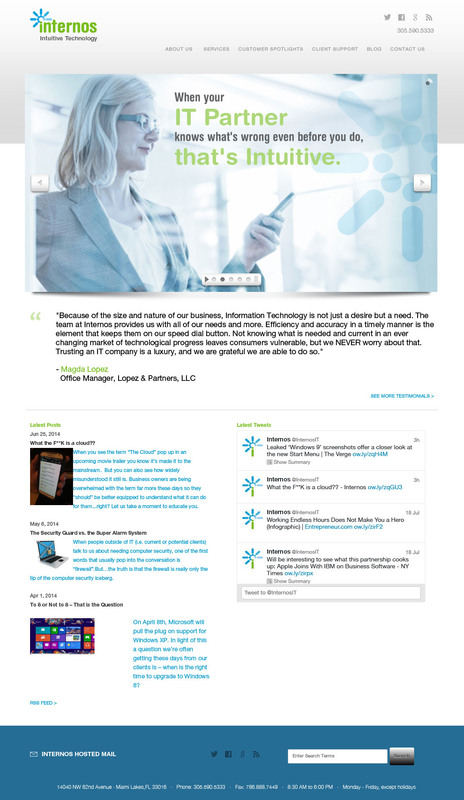 The site also had to facilitate customer access to remote tech support via a Help Desk portal. All pages would include a search feature, real-time Twitter feed and randomized testimonials that displayed seamlessly throughout. 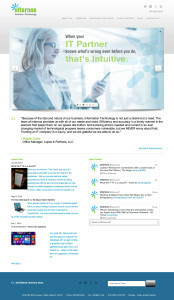 In a recent interview, the principals reported that they average 2-3 blog posts per month and 4-6 social media posts per week, and that “the back-end built into the site has made it very easy to update blogs and posts.” And eight months after the website’s launch, not only were no clients lost in the merger, but Internos has landed new ones. Existing clients have seen the merger/rebrand as a plus, and existing employees have embraced the company’s new brand identity and vision. Session duration for all visitors (new and returning) of 2:44 minutes. The work done for INTERNOS won a Gold Addy for the logo and stationery design; and two Hermes Creative awards, one for Overall Web Design in the Business to Consumer category, and one for Responsiveness of the Website, under the Mobile Site category.